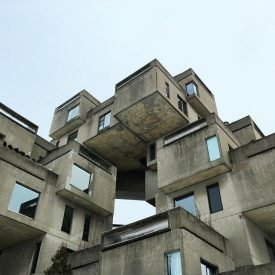 Habitat 67 in Montreal, Canada. Designed by Moshe Safdie. Saved from Montreall.com. The WWE starts us off with a video montage about the Greatest Royal Rumble. Roman Reigns is the first to be on screen live. He’s getting plenty of boos. Awesome that they’re playing into it with him being screwed. It’ll only make the people who are booing him, boo more which is only helping Reigns. Silence is the best solution. Samoa Joe is the first to interrupt. He never had faith in Reigns so he couldn’t lose it. Joe’s going to whoop him. Jinder Mahal pops out next and says that he has the real gripe, not Reigns, because Jeff Hardy cheated to win. Mahal wants to take him on. Sami Zayn is out next to a huge ovation. He was screwed over the most because an injury caused by Bobby Lashley made him miss the GRR. He wants to take on Reigns. Kevin Owens is out next. He wants Reigns too. Owens conducts a crowd poll. The heels end up attacking. Bobby Lashley comes out for the save. Braun Strowman comes out next. Lashley & Reigns are able to recover while Strowman is ganged up on. The faces stand tall after Strowman tosses Sunil Singh onto the heels. Elias is out for a concert. He does the usual before busting into his song about Montreal. Bobby Roode is his foil this evening. Is the crowd getting Canada fatigue already or did he get a smaller cheer than Zayn & Owens? Roode gets hung over the top rope to slow the initial momentum. Elias starts working over the neck, which makes sense given his finisher. I’m not sure I see the mule kick much but I like it. Elias only got a two count after it. Roode turns things around. A spine buster is his big first move. I’m not sure why he’s frustrated after that move. It isn’t a finisher and you were just being beaten down! Roode chopped Elias from the top rope. Elias got out of the Glorious DDT. Exchange of small packages. Elias is rammed throat first into the turn buckle. The referee calls for the EMTs. Elias announces himself as the winner. Akam & Rezar aka The Authors of Pain are out for their match. Jean-Paul & Francois are their opponents. They definitely don’t get a Canadian welcome. Last Chapter for a dominating win. They grab mics. They talk about the Book of Pain remaining open. They’re just scary dudes so I’ll let that sub par promo slide. Seth Rollins is getting love North of the border. He’s ready to party with the crowd so they do a round of “Ole! Ole! Ole!” Good for Rollins getting this sort of reaction. He doesn’t want to be a champion like Brock Lesnar. He wants to be out fighting every Monday night. Finn Balor comes out. They dig him too. He congratulates Rollins. He then mentions that they are 2-2 against each other. Balor wants a Title shot tonight. Rollins leaves it up to the crowd as to whether they’ll have a match tonight. Of course the match is made. Curtis Axel & Bo Dallas come out. They try to talk Balor & Rollins into a Four Horsemen of the WWE. Hard no. They try to jump Balor & Rollins but it back fires. Balor gives Rollins a Final Cut. Ruby Riott comes out with Sarah Logan & Liv Morgan. Charley Caruso interviews Sasha Banks back stage. She’s not sure what is up with Bayley. She’s not ready for the Riott Squad to run over the Raw women’s division. Would it be too much for the ladies of the Riott Squad to at least match their colors? Banks works over Riott’s arm early in the match. Riott had a small window of offense but then Banks started working over her again. Riott back drops Banks outside. The ref is fine that Logan tried to interfere. Shouldn’t she be tossed from ring side at least? Riott drop kicks Sasha face first into a turn buckle. Banks comes back fairly quickly. Riott dodges a corner charge. Middle rope Senton only gets Riott a two count. Banks counters a Riott Kick into a Bank Statement. Logan distracts the ref while Morgan saves Riott. Banks takes out Riott & Morgan. Logan’s third distraction leads to a Riott Kick for the win. We get another Moment of Bliss. This one is more believable to me because it was grounded in more reality. Making fun of whether Alexa Bliss can ride rides at an amusement park is something a friend would bust on you about and now she’s using it as a weapon. Titus O’Neil is getting plenty of air time with his slide. He admits to failing. Titus says it’s not about falling down, it’s about getting back up. Baron Corbin tells him that he’s a failure. Corey Graves selling The Woken Universe is wonderful, um delightful! Matt Hardy tells us that they have been at histories greatest triumphs. Their greatest victory was at the GRR. Bray Wyatt brings the darkness to Hardy’s light. They are really running with the Deleters of World. The big six man tag match starts with Roman Reigns & Jinder Mahal who quickly tags out to Sami Zayn. He in turn tags in Kevin Owens. Zayn ends up taking him on. Drive By for an early break. It’s really weird that Mahal is the only heel who is the same size as the baby face team. Lashley is the one selling which doesn’t help him at all even with the heel tactics gaining Owens the upper hand. Reigns gets to do his own selling later in the match. More heel stuff to still keep Owens in charge. Even a Superman Punch can’t get Reigns a tag. Mahal tags in. He gets a Samoan Drop. Strowman gets the hottest of tags. He takes out Owens & Zayn at ring side. Strowman rams himself into a post. Owens super kicks Strowman. Owens goes for the Cannon Ball. Strowman gets up. Power Slam for the win. The crowd is mad. Sort of. Baron Corbin wants to puke because of all of the nonsense between Titus O’Neil and No Way Jose. He comes out with the conga line. Titus O’Neil is joined on the ramp by Apollo Crews & Dana Brooke. Titus does a prat fall getting into the ring. Jose rolls up Corbin for the win. Natalya is set to take on Mickie James. They have Ronda Rousey & Alexa Bliss in their respective corners. Mickie gets control after dropping Nattie face first into a turn buckle. Bliss causes a distraction. James gains the upper hand. Rousey starts chasing Bliss. It distracts James. Small Package by Natalya for the win. Nia Jax comes out for a piece of Bliss who flees. Drew McIntyre & Dolph Ziggler get a selfie promo. They are positive that they are supposed to be there. Ziggler tells us it’s about to get dangerous.